Cardamom refers to several plants of the similar genera Elettaria and Amomum in the ginger family Zingiberaceae. Both genera are native to India, Pakistan, Nepal, and Bhutan; they are recognised by their small seed pods, triangular in cross-section and spindle-shaped, with a thin, papery, outer shell and small black seeds. Guatemala is the biggest producer and exporter of cardamom in the world, followed by India. Some other countries, such as Sri Lanka, have also begun to cultivate it. Elettaria pods are light green, while Amomum pods are larger and dark brown. It is the world’s third-most expensive spice by weight, outstripped in market value only by saffron and vanilla. The modern genus name Elettaria is derived from the local name in a South Asian tongue; cf. Hindi ilaychi [इलायची] and Punjabi ilaichi [ਇਲੈਚੀ] “green cardamom”. The common source is Sanskrit, where cardamom is called ela [एला] or ellka [एल्ल्का], which is itself a loan from a Dravidian language. From the corresponding Dravidian root, ĒL, all modern names of cardamom in the major Dravidian languages are directly derived, e. g., Kannada elakki [ಏಲಕ್ಕಿ], Telugu yelakulu [యేలకులు], Tamil elakkai [ஏலக்காய்] and Malayalam elakkay [ഏലക്കായ്]. The second element kai means “vegetable”. Elettaria (commonly called cardamom, green cardamom, or true cardamom) is distributed from India to Malaysia. Amomum (commonly known as black cardamom, brown cardamom, kravan, Java cardamom, Bengal cardamom, Siamese cardamom, white cardamom, or red cardamom) is distributed mainly in Asia and Australia. The two types of cardamom, κάρδαμομον and ἄμωμον, were distinguished in the fourth century BCE by the Greek father of botany, Theophrastus. Some of his informants[who?] told him these varieties came to Greece from the land of the Medes in northern Persia, while others were aware it came originally from India. Malabar (Nadan/native), as the name suggests, is the native variety of Kerala. These plants have panicles which grow horizontally along the ground. Mysore, as the name suggests, is a native variety of Karnataka. These plants have panicles which grow vertically upwards. The Mysore variety has, however, declined in the past few decades owing to the emergence of the more resistant and better yielding ‘Green Gold’ variety, and which is the most common form of cardamom harvested in Kerala. Recently, a few planters isolated high-yielding plants and started multiplying them on a large scale. The most popular high-yielding variety is ‘Njallani’. ‘Njallani’, also known as rup-ree-t, is a unique high-yielding cardamom variety developed by an Indian farmer, Sebastian Joseph, at Kattappana in the South Indian state of Kerala. K. J. Baby of Idukki District, Kerala, has developed a purely white-flowered variety of Vazhuka type green cardamom having higher yield than ‘Njallani’. The variety has high adaptability to different shade conditions and can also be grown in waterlogged areas. 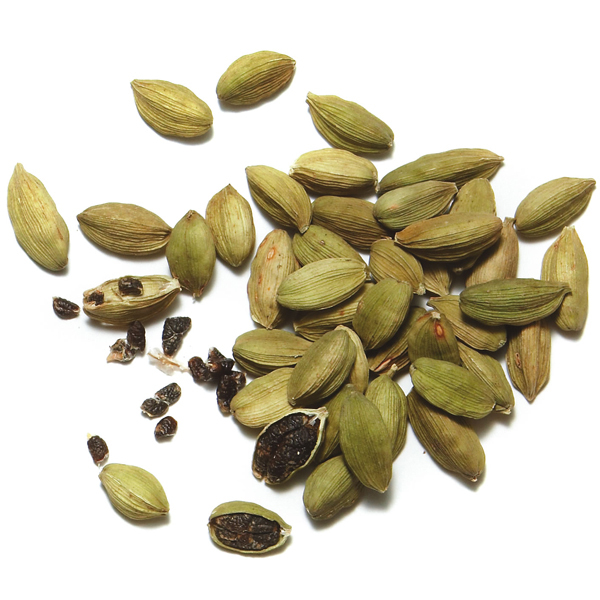 In South Asia, green cardamom is often used in traditional Indian sweets and in masala chai (spiced tea). Black cardamom is sometimes used in garam masala for curries. It is occasionally used as a garnish in basmati rice and other dishes. It is often referred to as fat cardamom due to its size. Individual seeds are sometimes chewed and used in much the same way as chewing gum. It is even used by confectionery giant Wrigley; its Eclipse Breeze Exotic Mint packaging indicates it contains “cardamom to neutralize the toughest breath odors”. It has been known to be used in making gin and herbal teas. Thank you for sharing excellent informations. Your web-site is very cool. I’m impressed by the details that you¡¦ve on this web site. It reveals how nicely you understand this subject. Bookmarked this website page, will come back for more articles. You, my pal, ROCK! I found simply the information I already searched all over the place and just could not come across. What a perfect web site. Greetings from California! I’m bored to death at work so I decided to check out your website on my iphone during lunch break. I really like the knowledge you provide here and can’t wait to take a look when I get home. I’m amazed at how quick your blog loaded on my cell phone .. I’m not even using WIFI, just 3G .. Anyhow, awesome blog! Excellent post. I was checking constantly this blog and I am impressed! Very helpful information specifically the last part I care for such information much. I was seeking this particular information for a long time. Thank you and good luck. Somebody essentially assist to make seriously articles I’d state. This is the very first time I frequented your website page and so far? I surprised with the analysis you made to create this actual publish incredible. Fantastic process! Thanks , I’ve just been searching for info approximately this topic for a long time and yours is the best I’ve came upon so far. But, what concerning the bottom line? Are you sure concerning the source? It is truly a great and useful piece of info. I¡¦m happy that you simply shared this helpful info with us. Please stay us informed like this. Thanks for sharing. Thank you for sharing superb informations. Your web-site is very cool. I am impressed by the details that you’ve on this web site. It reveals how nicely you perceive this subject. Bookmarked this website page, will come back for extra articles. You, my friend, ROCK! I found simply the info I already searched all over the place and just couldn’t come across. What an ideal web-site. Needed to create you this very small word to be able to thank you over again about the awesome basics you’ve documented in this article. It was really extremely open-handed with you to convey unhampered exactly what most of us would’ve marketed as an ebook to earn some cash for their own end, principally seeing that you could have tried it in case you desired. The pointers likewise acted to become a good way to fully grasp that other people online have the identical fervor much like my personal own to know lots more on the subject of this condition. I am sure there are lots of more pleasurable opportunities in the future for individuals that go through your website. I wanted to post you a little observation to be able to say thanks once again for the extraordinary suggestions you’ve contributed in this case. It was certainly particularly open-handed with people like you to convey without restraint just what a number of us would have offered for sale for an ebook to help with making some money for their own end, especially given that you might have tried it if you decided. The suggestions as well worked like the fantastic way to comprehend other people have similar fervor just as my personal own to see more pertaining to this problem. I am sure there are lots of more pleasant instances up front for those who see your blog post. Thanks a lot for providing individuals with an exceptionally marvellous opportunity to check tips from here. It is usually very fantastic and also packed with fun for me personally and my office acquaintances to visit your website more than 3 times a week to read the latest issues you have got. And lastly, I am just certainly happy with your surprising thoughts served by you. Certain two points in this post are truly the best I’ve ever had. Wonderful goods from you, man. I’ve understand your stuff previous to and you’re just extremely wonderful. I really like what you have acquired here, certainly like what you’re stating and the way in which you say it. You make it enjoyable and you still take care of to keep it sensible. I can not wait to read far more from you. This is really a tremendous website. I intended to draft you the little bit of note to finally thank you so much once again for those stunning guidelines you have provided on this page. This is simply particularly open-handed with you to offer easily what exactly many of us would have sold for an ebook in making some dough for themselves, specifically seeing that you might have done it if you wanted. These concepts additionally served to be a easy way to be aware that most people have the same fervor similar to my very own to find out good deal more in regard to this matter. I am certain there are numerous more enjoyable periods ahead for many who view your blog. Excellent post. I was checking continuously this blog and I’m impressed! Extremely helpful info specially the last part I care for such info a lot. I was looking for this certain information for a very long time. Thank you and good luck. Needed to put you one very small note to finally give many thanks once again for your personal great basics you’ve discussed in this case. It’s so unbelievably generous with you to grant openly exactly what numerous people would’ve offered for sale for an e book to help with making some money on their own, most notably now that you might have done it in the event you considered necessary. Those advice also served like a fantastic way to be sure that many people have a similar passion just as mine to understand whole lot more pertaining to this condition. I am sure there are lots of more pleasant moments up front for many who examine your blog. I’ve been which means to publish about some thing like this distinct on a single of our weblogs which options provided me a thought. Thanks. I really wanted to construct a comment to be able to thank you for these stunning solutions you are placing on this website. My incredibly long internet lookup has now been compensated with wonderful information to exchange with my classmates and friends. I ‘d assume that most of us readers are truly fortunate to dwell in a really good network with so many special professionals with very beneficial guidelines. I feel very lucky to have used your entire website page and look forward to many more fabulous times reading here. Thanks once more for all the details. Fantastic goods from you, man. I have understand your stuff previous to and you are just extremely great. I really like what you’ve acquired here, certainly like what you’re stating and the way in which you say it. You make it entertaining and you still take care of to keep it wise. I can’t wait to read much more from you. This is actually a terrific site. I do agree with all the concepts you have presented on your post. They are very convincing and will certainly work. Still, the posts are too quick for novices. Could you please lengthen them a little from subsequent time? Thank you for the post. Fantastic goods from you, man. I’ve understand your stuff previous to and you are just too excellent. I actually like what you have acquired here, certainly like what you are stating and the way in which you say it. You make it entertaining and you still care for to keep it wise. I can not wait to read far more from you. This is actually a great web site. Howdy very cool web site!! Man .. Beautiful .. Superb .. I will bookmark your blog and take the feeds additionally¡KI am satisfied to seek out a lot of helpful info right here in the publish, we’d like work out extra strategies on this regard, thank you for sharing. . . . . .
My husband and i were really more than happy when Albert could carry out his survey because of the ideas he made through the web pages. It’s not at all simplistic to simply always be offering hints many others might have been making money from. We know we’ve got you to thank for this. The entire explanations you made, the straightforward blog menu, the friendships your site aid to instill – it’s got mostly impressive, and it’s really letting our son and us understand this idea is fun, which is certainly extremely essential. Thanks for all! certainly like your website however you have to test the spelling on quite a few of your posts. A number of them are rife with spelling issues and I in finding it very bothersome to inform the reality on the other hand I will certainly come back again. hello!,I really like your writing very much! proportion we keep in touch extra about your article on AOL? I require an expert on this house to solve my problem. Maybe that’s you! Looking forward to look you. Great amazing issues here. I am very happy to look your article. Thanks so much and i’m having a look ahead to contact you. Will you kindly drop me a mail? Wonderful web site. A lot of useful information here. I¡¦m sending it to a few pals ans additionally sharing in delicious. And certainly, thanks in your sweat! You completed a few fine points there. I did a search on the issue and found the majority of people will have the same opinion with your blog. certainly like your web site but you need to test the spelling on several of your posts. Several of them are rife with spelling issues and I in finding it very bothersome to inform the reality on the other hand I¡¦ll certainly come back again. Great awesome issues here. I am very happy to look your post. Thank you a lot and i am having a look forward to contact you. Will you kindly drop me a e-mail? My coder is trying to persuade me to move to .net from PHP. I have always disliked the idea because of the expenses. But he’s tryiong none the less. I’ve been using Movable-type on numerous websites for about a year and am anxious about switching to another platform. I have heard fantastic things about blogengine.net. Is there a way I can import all my wordpress posts into it? Any kind of help would be really appreciated! Good day! I know this is kinda off topic however I’d figured I’d ask. Would you be interested in trading links or maybe guest authoring a blog article or vice-versa? My blog discusses a lot of the same subjects as yours and I think we could greatly benefit from each other. If you might be interested feel free to send me an e-mail. I look forward to hearing from you! Great blog by the way! you’re truly a excellent webmaster. The website loading pace is incredible. It seems that you’re doing any distinctive trick. In addition, The contents are masterpiece. you’ve performed a wonderful job in this subject! great post, very informative. I wonder why the opposite specialists of this sector do not realize this. You should continue your writing. I’m confident, you have a huge readers’ base already! I wish to voice my gratitude for your kindness for persons that really want help with this particular field. Your very own dedication to passing the solution all-around had become amazingly useful and has consistently empowered people like me to realize their desired goals. The informative report signifies this much a person like me and even further to my office colleagues. With thanks; from each one of us.